During the past 10,000 years, there are about 1,500 volcanoes on land that are known to have been active, while the even larger number of submarine volcanoes is unknown. At present, there are about 600 volcanoes that have had known eruptions during recorded history, while about 50-70 volcanoes are active (erupting) each year. At any given time, there is an average of about 20 volcanoes that are erupting. Active volcanoes in the U.S. are found mainly in Hawaii, Alaska, California, Oregon and Washington. One of the major factors that affect overall climate are volcanoes. If a volcanic eruption occurs in Russia, it can affect North American weather if the eruption is at least 3 kilometers high. If an eruption occurs in the southern hemisphere and is 16 kilometers high, the entire globe will have its climate affected. Simply put, volcanic eruptions can alter the expected outcome of crops, investments, oil, ranching and many other factors that affect the economy of the world. 19 May 10 – “Global warming” may become one of those quaint cocktail party conversations of the past if three key climate drivers – 1) cooling North Pacific sea surface temperatures, 2) extremely low solar activity and 3) increased volcanic eruptions – converge to form a “perfect storm” of plummeting temperatures that send our planet into a long-term cool-down lasting 20 or 30 years or longer. “There are some wild cards that are different from what we saw when we came out of the last warm PDO [Pacific Decadal Oscillation] and entered its cool phase [1947 to 1976]. Now we have a very weak solar cycle and the possibility of increased volcanic activity. Together, they would create what I call the ‘Triple Crown of Cooling,’” says Accuweather meteorologist Joe Bastardi. If all three climate-change ingredients come together, it would be a recipe for dangerously cold temperatures that would shorten the agricultural growing season in northern latitudes, crippling grain production in the wheat belts of the United States and Canada and triggering widespread food shortages and famine. The Pacific Decadal Oscillation refers to cyclical variations in sea surface temperatures that occur in the North Pacific Ocean. (The PDO is often described as a long-lived El Niño-like pattern.) PDO events usually persist for 20 to 30 years, alternating between warm and cool phases. From 1977 to 1998, during the height of “global warming,” North America was in the midst of a warm PDO. But the PDO has once again resumed its negative cool phase, and, as such, represents the first climate driver in the Triple Crown of Cooling. With the switch to a cool PDO, we’ve seen a change in the El Nino/Southern Oscillation (ENSO), which alternates between El Nino (warm phase) and La Nina (cool phase) every few years. The recent strong El Nino that began in July 2009 is now transitioning to a La Nina, a sign of cooler temperatures ahead. “We’re definitely headed towards La Nina conditions before summer is over, and we’re looking at a moderate to strong La Nina by fall and winter, which …should bring us cooler temperatures over the next few years,” predicts Joe D’Aleo, founder of the International Climate and Environmental Change Assessment Project (ICECAP) and the first director of meteorology at the Weather Channel. He is not alone in his forecast. Bastardi also sees a La Nina just around the corner. “I’ve been saying since February that we’ll transition to La Nina by the middle of the hurricane season. I think we’re already seeing the atmosphere going into a La Nina state in advance of water temperatures. This will have interesting implications down the road. La Nina will dramatically cool off everything later this year and into next year, and it is a signal for strong hurricane activity,” Bastardi predicts. The difference in sea surface temperature between positive and negative PDO phases is not more than 1 to 2 degrees Celsius, but the affected area is huge. So the temperature changes can have a big impact on the climate in North America. Another real concern – and the second climate driver in the Triple Crown of Cooling – is the continued stretch of weak solar activity… We recently exited the longest solar minimum –12.7 years compared to the 11-year average – in 100 years. It was a historically inactive period in terms of sunspot numbers. During the minimum, which began in 2004, we have experienced 800 spotless days. A normal cycle averages 485 spotless days. In 2008, we experienced 265 days without a sunspot, the fourth-highest number of spotless days since continuous daily observations began in 1849. In 2009, the trend continued, with 261 spotless days, ranking it among the top five blank-sun years. Only 1878, 1901 and 1913 (the record-holder with 311 days) recorded more spotless days. In 2010, the sun continues to remain in a funk. There were 27 spotless days (according to Layman’s sunspot count) in April and, as of May 19, 12 days without a spot. Both months exhibited periods of inexplicably low solar activity during a time when the sun should be flexing its “solar muscle” and ramping up towards the next solar maximum. Why are sunspot numbers important? Very simple: there is a strong correlation between sunspot activity and global temperature. During the Dalton Minimum (1790 – 1830) and Maunder Minimum (1645 -1715), two periods with very low sunspot activity, temperatures in the Northern Hemisphere plummeted. During the Dalton Minimum, the abnormally cold weather destroyed crops in northern Europe, the northeastern United States and eastern Canada. Historian John D. Post called it “the last great subsistence crisis in the Western world.” The record cold intensified after the eruption of Mount Tambora in 1815, the largest volcanic eruption in more than 1,600 years (see details below). During the 70-year Maunder Minimum, astronomers at the time counted only a few dozen sunspots per year, thousands fewer than usual. As sunspots vanished, temperatures fell. The River Thames in London froze, sea ice was reported along the coasts of southeast England, and ice floes blocked many harbors. Agricultural production nose-dived as growing seasons became shorter, leading to lower crop yields, food shortages and famine. If the low levels of solar activity during the past three years continue through the current solar cycle … we could be facing a severe temperature decline within the next five to eight years. Unfortunately, there is a very real chance Eyjafjallajokull’s much larger neighbor, the Katla volcano, could blow its top, creating the third-climate driver in the ‘Triple Crown of Cooling’. If Katla does erupt, it would send global temperatures into a nosedive, with a big assist from the cool PDO and a slumbering sun. The Katla caldera measures 42 square miles and has a magma chamber with a volume of around 2.4 cubic miles, enough to produce a Volcanic Explosivity Index (VEI) level-six eruption – an event ten times larger than Mount St. Helens. Katla erupts about every 70 years or so, most recently in 1918, often in tandem with neighboring Eyjafjallajokull, which is not a good sign. Not a very encouraging outlook. Yet major eruptions throughout history bear witness to the deadly impact of volcanoes. When (Katla) unleashed its fury in the 1700s, the volcano sent temperatures into a tailspin in North America. “The Mississippi River froze just north of New Orleans and the East Coast, especially New England, had an extremely cold winter. Actions to limit CO2 emissions should be shelved and preparations made for an extended period of global cooling that would pose far more danger to humankind than any real or imagined warming predicted by today’s climate models. The Year Without a Summer (also known as, a) The Poverty Year, b) The Year There Was No Summer and c) Eighteen Hundred and Froze to Death) was 1816, in which severe summer climate abnormalities caused average global temperatures to decrease by about 0.4–0.7 °C (0.7–1.3 °F), resulting in major food shortages across the Northern Hemisphere. It is believed that the anomaly was caused by a combination of 1) a historic low in solar activity with 2) a volcanic winter event, the latter caused by a succession of major volcanic eruptions capped off by the Mount Tambora eruption of 1815, the largest known eruption in over 1,600 years. Historian John D. Post has called this “the last great subsistence crisis in the Western world”. The unusual climatic aberrations of 1816 had the greatest effect on the Northeastern United States, the Canadian Maritimes, Newfoundland, and Northern Europe. Typically, the late spring and summer of the northeastern U.S. and southeastern Canada are relatively stable: temperatures (average of both day and night) average about 68–77 °F and rarely fall below 41 °F. Summer snow is an extreme rarity. In the spring and summer of 1816, a persistent “dry fog” was observed in the northeastern United States. The fog reddened and dimmed the sunlight, such that sunspots were visible to the naked eye. Neither wind nor rainfall dispersed the “fog”. It has been characterized as a stratospheric sulfate aerosol veil. In May 1816, frost killed off most of the crops that had been planted, and on 4 June 1816, frosts were reported in Connecticut, and by the following day, most of New England was gripped by the cold front. On 6 June 1816, snow fell in Albany, New York, and Dennysville, Maine. Nearly a foot of snow was observed in Quebec City in early June, with consequent additional loss of crops—most summer-growing plants have cell walls which rupture even in a mild frost. The result was regional malnutrition, starvation, epidemic, and increased mortality. In July and August, lake and river ice were observed as far south as Pennsylvania. Rapid, dramatic temperature swings were common, with temperatures sometimes reverting from normal or above-normal summer temperatures as high as 95°F to near-freezing within hours. Even though farmers south of New England did succeed in bringing some crops to maturity, maize and other grain prices rose dramatically. The staple food oats, for example, rose from 12¢ a bushel the previous year to 92¢ a bushel –nearly eight times as much. Those areas suffering local crop failures had to deal with the lack of roads in the early 19th Century, preventing any easy importation of bulky food stuffs. Cool temperatures and heavy rains resulted in failed harvests in the British Isles as well. Families in Wales traveled long distances as refugees, begging for food. Famine was prevalent in north and southwest Ireland, following the failure of wheat, oat, and potato harvests. The crisis was severe in Germany, where food prices rose sharply. Due to the unknown cause of the problems, demonstrations in front of grain markets and bakeries, followed by riots, arson, and looting, took place in many European cities. It was the worst famine of the 19th Century. In China, the cold weather killed trees, rice crops, and even water buffalo, especially in northern China. Floods destroyed many remaining crops. Mount Tambora’s eruption disrupted China’s monsoon season, resulting in overwhelming floods in the Yangtze Valley in 1816. In India the delayed summer monsoon caused late torrential rains that aggravated the spread of cholera from a region near the River Ganges in Bengal to as far as Moscow. In the ensuing bitter winter of 1817, when the thermometer dropped to -26°F, the waters of New York’s Upper Bay froze deeply enough for horse-drawn sleighs to be driven across Buttermilk Channel from Brooklyn to Governors Island. The effects were widespread and lasted beyond the winter. In eastern Switzerland, the summers of 1816 and 1817 were so cool that an ice dam formed below a tongue of the Giétro Glacier high in the Val de Bagnes. In spite of the efforts of the engineer Ignaz Venetz to drain the growing lake, the ice dam collapsed catastrophically in June 1818. It is now generally thought that the aberrations occurred because of the 1815 (April 5–15) volcanic Mount Tambora eruption on the island of Sumbawa, Indonesia (then part of the Dutch East Indies). The eruption had a Volcanic Explosivity Index ranking of 7, a super-colossal event that ejected immense amounts of volcanic dust into the upper atmosphere. It was the world’s largest eruption since the Hatepe eruption over 1,630 years earlier in AD 180. The fact that the 1815 eruption occurred during the middle of the Dalton Minimum (a period of unusually low solar activity) is also significant. These other eruptions had already built up a substantial amount of atmospheric dust. As is common following a massive volcanic eruption, temperatures fell worldwide because less sunlight passed through the atmosphere. As a result of the series of volcanic eruptions, crops in the above-cited areas had been poor for several years; the final blow came in 1815 with the eruption of Tambora. In the United States, many historians cite the “Year Without a Summer” as a primary motivation for the western movement and rapid settlement of what is now western and central New York and the American Midwest. Many New Englanders were wiped out by the year, and tens of thousands struck out for the richer soil and better growing conditions of the Upper Midwest (then the Northwest Territory). Europe, still recuperating from the Napoleonic Wars, suffered from food shortages. Food riots broke out in the United Kingdom and France, and grain warehouses were looted. The violence was worst in landlocked Switzerland, where famine caused the government to declare a national emergency. Huge storms and abnormal rainfall with floodings of the major rivers of Europe (including the Rhine) are attributed to the event, as was the frost setting in during August 1816. A major typhus epidemic occurred in Ireland between 1816 and 1819, precipitated by the famine caused by “The Year Without a Summer”. It is estimated that 100,000 Irish perished during this period. A BBC documentary using figures compiled in Switzerland estimated that fatality rates in 1816 were twice that of average years, giving an approximate European fatality total of 200,000 deaths. The eruption of Tambora also caused Hungary to experience brown snow. Italy experienced something similar, with red snow falling throughout the year. The cause of this is believed to have been volcanic ash in the atmosphere. In China, unusually low temperatures in summer and fall devastated rice production in Yunnan province in the southwest, resulting in widespread famine. Fort Shuangcheng, now in Heilongjiang province, reported fields disrupted by frost and conscripts deserting as a result. Summer snowfall was reported in various locations in Jiangxi and Anhui provinces, both in the south of the country. In Taiwan, which has a tropical climate, snow was reported in Hsinchu and Miaoli, while frost was reported in Changhua. The lack of oats to feed horses may have inspired the German inventor Karl Drais to research new ways of horseless transportation, which led to the invention of the Draisine or velocipede. This was the ancestor of the modern bicycle and a step toward mechanized personal transport. The crop failures of the “Year without Summer” forced the family of Joseph Smith to move from Sharon, Vermont, to Palmyra, New York, precipitating a series of events which culminated in the publication of the Book of Mormon and the founding of the Church of Jesus Christ of Latter-day Saints. In July 1816 “incessant rainfall” during that “wet, ungenial summer” forced Mary Shelley, John William Polidori, and their friends to stay indoors for much of their Swiss holiday. They decided to have a contest to see who could write the scariest story, leading Shelley to write Frankenstein, or The Modern Prometheus and Polidori to write The Vampyre. In addition, their host, Lord Byron, was inspired to write a poem, Darkness, at the same time. Justus von Liebig, a chemist who had experienced the famine as a child in Darmstadt, later studied plant nutrition and introduced mineral fertilizers. • Toba catastrophe 70,000 to 75,000 years ago. • The 1628–26 BC climate disturbances, usually attributed to the Minoan eruption of Santorini. • The Hekla 3 eruption of about 1200 BC, contemporary with the historical bronze age collapse. • Climate changes of 535–536 have been linked to the effects of a volcanic eruption, possibly at Krakatoa. • An eruption of Kuwae, a Pacific volcano, has been implicated in events surrounding the Fall of Constantinople in 1453. • An eruption of Huaynaputina, in Peru, caused 1601 to be the coldest year in the Northern Hemisphere for six centuries (see Russian famine of 1601–1603). • An eruption of Laki, in Iceland, caused major fatalities in Europe, 1783–84. • The eruption of Mount Pinatubo in 1991 led to odd weather patterns and temporary cooling in the United States, particularly in the Midwest and parts of the Northeast. An unusually mild winter and warm and early spring were followed by an unusually cool and wet summer in 1992. Each day, the morning sunrise is taken for granted. Based on the laws of science, it is expected that the sun will rise each day from east to west. Yet, the question must be asked, “what would happen if the sun didn’t rise?” This was the case from AD 535 through AD 546, with the darkest days in AD 536. “A mighty roar of thunder” came out of the local mountain; there was a furious shaking of the earth, total darkness, thunder and lightning.” A Chinese court journal also made mention of “a huge thunderous sound coming from the south west” in February 535.2 And as a Hopi elder had said, thousands of miles away, “When the changes begin, there will be a big noise heard all over the Earth,” a low rumble reverberated across the planet. “Then came forth a furious gale together with torrential rain and a deadly storm darkened the entire world,” read the Pustaka Raja Purwa or The Book of Ancient Kings, a buried Indonesian chronicle. “The sun began to go dark, rain poured red, as if tinted by blood. Clouds of dust enveloped the earth… Yellow dust rained down like snow. It could be scooped up in handfuls,” wrote The Nan Shi Ancient Chronicle of Southern China, referring to the country’s weather in November and December 535. A cold then gripped the world as temperatures declined. “We have had a winter without storms…”1 “a spring without mildness [and] a summer without heat… The months which should have been maturing the crops have been chilled by north winds,” wrote Cassiodorus. “When can we hope for mild weather, now that the months that once ripened the crops have become deadly sick under the northern blasts? …Out of all the elements, we find these two against us: perpetual frost and unnatural drought,” he added, while in China, it was written, “the stars were lost from view for three months. The sun dimmed, the rain failed, and snow fell in the summertime. Famine spread, and the emperor abandoned his capital…” Other Chinese records referred to a ‘dust veil’ obscuring the sky” while Mediterranean historians wrote about a “‘dry fog’ blocking out much of the sun’s heat for more than year.” The sun was so ineffective that snow even fell during August in southern China and in every month of the year in northern Europe. “Then came drought [or floods], famine, plague, death…” “Food is the basis of the Empire. Yellow gold and ten thousand strings of cash cannot cure hunger. What avails a thousand boxes of pearls to him who is starving of cold,” the Japanese Great King lamented in 540, while Cassiodorus added, “Rain is denied and the reaper fears new frosts.” And “as hard winters and drought continued into the second and third years [in Mongolia and parts of China, the Avars] unable to find food, unable to barter food from others…” began a 3,000-mile trek to new lands to save themselves and their families from annihilation and starvation. During this sustained period of unseasonably cold temperatures from 535-546 when the sun was ineffective and blotted out, plant life experienced stunted growth – tree rings from this period show little or no growth – and many crops failed. According to climatological research presented in 2001 by Markus Lindholm of the University of Helsinki, Finland, Abrupt changes in northern Fennoscandian summer temperatures extracted from the 7500-year ring-width chronology of Scots pine, the “most dramatic shift in growing conditions, from favorable to unfavorable, between two years, took place between A.D. 535-536” in Europe and Africa. His findings were corroborated by Mike Baillie of the University of Belfast, who based on his tree ring chronologies, some from specimens preserved in bogs, that dated back thousands of years stated, “It was a catastrophic environmental downturn that shows up in trees all over the world. Temperatures dropped enough to hinder the growth of trees as widely dispersed as northern Europe, Siberia, western North America, and southern South America.” Ominously, the cold brought rats, mice and fleas that normally lived outdoors, into peoples’ homes in search of food and warmth because of the decimation that was occurring to the animal population in the suddenly hostile, chilly dark environment. Deadly bacterium, Yersinia pestis was then transmitted to people and their pets. Within seven years, due to the ivory trade, in which ships brought rats and sailors infected by the plague, Europe and the Middle East were being ravaged. In Constantinople alone, “they had to dispose of over 10,000 bodies a day, week after week, throwing them into the sea off special boats, sticking them in the towers of the city wall, filling up cisterns, digging up orchards. Soldiers were forced to dig mass graves… chaos and pandemonium [reigned]. Constantinople stank for months after months [from the decaying bodies that were stuffed in towers and stacked or dumped in streets]… [and] when the number of dead reached a quarter of a million, Constantinople officials simply stopped counting. Out of fear, many people refused to venture out of their homes — “…houses became tombs, as whole families died from the plague without anyone from the outside world even knowing. Streets were deserted…” Furthermore because of this fear and/or the affects of suffering from high fever, scores of people hallucinated, seeing apparitions and visions. And with the vast pestilence and destruction all around them, many could not help but wonder if the apocalypse as described in Revelation 6:8 “And I looked, and behold, a pale horse; and his name that sat on him was Death” was upon them. It was so bad that some thirty years later, Pope Gregory The Great wrote of Rome, “Ruins on ruins… Where is the senate? Where are the people? All the pomp of secular dignities has been destroyed… And we, the few that we are who remain, every day we are menaced by scourges and innumerable trials.” In its height, the plague “depopulated towns, turned the country into a desert and made the habitations of men to become the haunts of wild beasts” while in Africa, major ports ceased to exist and agricultural practices all but vanished. “And as others left the stricken city wearing identification tags so that their bodies would be buried if found] they took the plague to towns, villages and farms throughout the empire. To compound matters, with trade and commerce virtually nonexistent, food became scarce leading to the starvation of others. Untold millions perished,” with an estimated death toll of 100 million, the worst pandemic in human history. When the sun finally came out, overcoming the affects of a massive volcanic eruption, even though it hadn’t really been gone, minimizing the adverse affects and saving living creatures from complete extinction, the world was forever transformed. Countries and civilizations had ceased to exist while others emerged as the days of darkness “weakened the Eastern Roman Empire; created horrendous living conditions in the western part of Great Britain; contributed through drought… to the fall of the Teotihuacan civilization in Mexico; and through flooding to the collapse of a major center of civilization in Yemen;” while major upheavals occurred in China and France. More than half the world’s population when taking Europe, Asia, Africa, and the Americas, into account, along with countless numbers of plants and animals, had perished illustrating the fragile relationship that exists between people and nature. The first half of the Great Famine of 1315–1322 in Europe may have been precipitated by a volcanic event, perhaps that of Kaharoa, New Zealand; the unusual weather patterns of the period are similar to those found following volcanic eruptions, such as the Mount Tambora eruption of April 1815 that caused ‘The Year Without a Summer’ in Europe. The Great Famine lasted seven years, from 1315 to 1322, for which reason it is sometimes compared to the famine of Egypt in Genesis 41. The first three years, however, were the most severe, and they adversely affected the next decade. Even chroniclers in the 18th and 19th centuries pointed out the severe food shortages and torrential weather patterns of 1310-1320. There was a catastrophic dip in the weather during the Medieval Warm Period that coincided with the onset of the Great Famine. Between 1310 and 1330 northern Europe saw some of the worst and most sustained periods of bad weather in the entire Middle Ages, characterized by severe winters and rainy and cold summers. In the spring of 1315, unusually heavy rain began in much of Europe. Throughout the spring and summer, it continued to rain and the temperature remained cool. The rains began early in May and did not let up until September. These conditions caused widespread crop failures. The straw and hay for the animals could not be cured and there was no fodder for the livestock. The price of food began to rise. Food prices in England doubled between spring and midsummer. Salt, the only way to cure and preserve meat, was difficult to obtain because it could not be evaporated in the wet weather; it went from 30 shillings to 40 shillings. In Lorraine, wheat prices increased by 320 percent and peasants could no longer afford bread. Stores of grain for long-term emergencies were limited to the lords and nobles. Because of the general increased population pressures, even lower-than-average harvests meant some people would go hungry; there was little margin for failure. People began to harvest wild edible roots, plants, grasses, nuts, and bark in the forests. There are a number of documented incidents that show the extent of the famine. Edward II, King of England, stopped at St Albans on 10 August 1315 and no bread could be found for him or his entourage; it was a rare occasion in which the King of England was unable to eat. In the spring of 1316, it continued to rain on a European population deprived of energy and reserves to sustain itself. All segments of society from nobles to peasants were affected, but especially the peasants who represented 95% of the population and who had no reserve food supplies. To provide some measure of relief, draft animals were butchered, seed grain was consumed, children were abandoned to fend for themselves (see “Hansel and Gretel”), and some elderly people voluntarily refused food in order to provide nourishment needed for the younger generation to survive. The chroniclers of the time wrote of many incidents of cannibalism. Of poor men who called out, “Alas! For hunger I die …! —Poem on the Evil Times of Edward II, c. 1321. The height of the famine was reached in 1317 as the wet weather continued. Finally, in the summer the weather returned to its normal patterns. By now, however, people were so weakened by diseases such as pneumonia, bronchitis, and tuberculosis, and so much of the seed stock had been eaten, that it was not until 1325 that the food supply returned to relatively normal conditions and the population began to increase again. Historians debate the toll but it is estimated that 10–25% of the population of many cities and towns died. While the Black Death (1338–1375) would kill more people, it often swept through an area in a matter of months whereas the Great Famine lingered for years, drawing out the suffering of the populace. In 1815, the Indonesian volcano Tambora propelled more ash and volcanic gases into the atmosphere than any other eruption in history and resulted in significant atmospheric cooling on a global scale, much like Krakatau a few decades later. 1816 was known as the year without summer … famines in Europe and China … snowstorms killing people in June in Canada and New England …. even a book describing processions held by the church in the holy land (around Jerusalem ) praying for the famine to end … the wet weather caused eruption of ergot in France … just like in the medieval times. The first connection between volcanoes and global climate was made by Benjamin Franklin in 1783 while stationed in Paris as the first diplomatic representative of the United States of America. He observed that during the summer of 1783, the climate was abnormally cold, both in Europe and back in the U.S. The ground froze early, the first snow stayed on the ground without melting, the winter was more severe than usual, and there seemed to be “a constant fog over all Europe, and a great part of North America. What Benjamin Franklin observed was indeed the result of volcanic activity. An enormous eruption of the Laid fissure system (a chain of volcanoes in which the lava erupts through a crack in the ground instead of from a single point) in Iceland caused the disruptions. The Laid eruptions produced about 14 cubic kilometers of basalt (thin, black, fluid lava) during more than eight months of activity. More importantly in terms of global climate, however, the Laid Event also produced an ash cloud that may have reached up into the stratosphere. This cloud caused a dense haze across Europe that dimmed the sun, perhaps far west as Siberia. In addition to ash, the eruptive cloud consisted primarily of vast quantities of sulfur dioxide (SO2), hydrogen chloride (HCL), and hydrogen fluoride gases (HF). The gases combined with water in the atmosphere to produce acid rain, destroying crops and killing livestock. The effects, of course, were most severe in Iceland; ultimately, more than 75 percent of Iceland’s livestock and 25 percent of its human population died from famine or the toxic impact of the Laid eruption clouds. Consequences were also felt far beyond Iceland. Temperature data from the U.S. indicate that records low occurred during the winter of 1783-1784. In fact, the temperature decreased about one degree Celsius in the Northern Hemisphere. It may not sound like much, but it had enormous effects in terms of food supplies and the survival of people across the Northern Hemisphere. For comparison, the global temperature of the most recent Ice Age was only about five degrees C below the current average. There are many reasons that large volcanic eruptions have such far-reaching effects on global climate. First, volcanic eruptions produce major quantities of carbon dioxide (C02), a gas known to contribute to the greenhouse effect. Such greenhouse gases trap heat radiated off of the surface of the earth forming a type of insulation around the planet. The greenhouse effect is essential for our survival because it maintains the temperature of our planet within a habitable range. Nevertheless, there is growing concern that our production of gases such as CO2 from the burning of fossil fuels may be pushing the system a little too far, resulting in excessive warming on a global scale. There is no doubt that volcanic eruptions add CO2 to the atmosphere, but compared to the quantity produced by human activities, their impact is virtually trivial: volcanic eruptions produce about 110 million tons of CO2 each year, whereas human activities contribute almost 10,000 times that quantity. By far the more substantive climatic effect from volcanoes results from the production of atmospheric haze. Large eruption columns inject ash particles and sulfur-rich gases into the troposphere and stratosphere and these clouds can circle the globe within weeks of the volcanic activity. The small ash particles decrease the amount of sunlight reaching the surface of the earth and lower average global temperatures. The sulfurous gases combine with water in the atmosphere to form acidic aerosols that also absorb incoming solar radiation and scatter it back out into space. The ash and aerosol clouds from large volcanic eruptions spread quickly through the atmosphere. On August26 and 27, 1883, the volcano Krakatau erupted in a catastrophic event that ejected about 20 cubic kilometers of material in an eruption column almost 40 kilometers high. Darkness immediately enveloped the neighboring Indonesian islands of Java and Sumatra. Fine particles, however, rode atmospheric currents westward. By the afternoon of August 28th, haze from the Krakatau eruption had reached South Africa and by September 9th it had circled the globe, only to do so several more times before settling out of the atmosphere. Initially, scientists believed that it was volcanoes stratospheric ash clouds that had the dominant effect on global temperatures. The 1982 eruption of El Chichon in Mexico, however, altered that view. Only two years earlier, the major Mt. St. Helens eruption had lowered global temperatures by about 0.1 degree C.
The much smaller eruption of El Chichon, in contrast, had three to five times the global cooling effect worldwide. Despite its smaller ash cloud, El Chichon emitted more than 40 times the volume of sulfur-rich gases produced by Mt. St. Helens, which revealed that the formation of atmospheric sulfur aerosols has a more substantial effect on global temperatures than simply the volume of ash produced during an eruption. Sulfate aerosols appear to take several years to settle out of the atmosphere, which is one of the reasons their effects are so widespread and long lasting. The atmospheric effects of volcanic eruptions were confirmed by the 1991 eruption of Mount Pinatubo, in the Philippines. 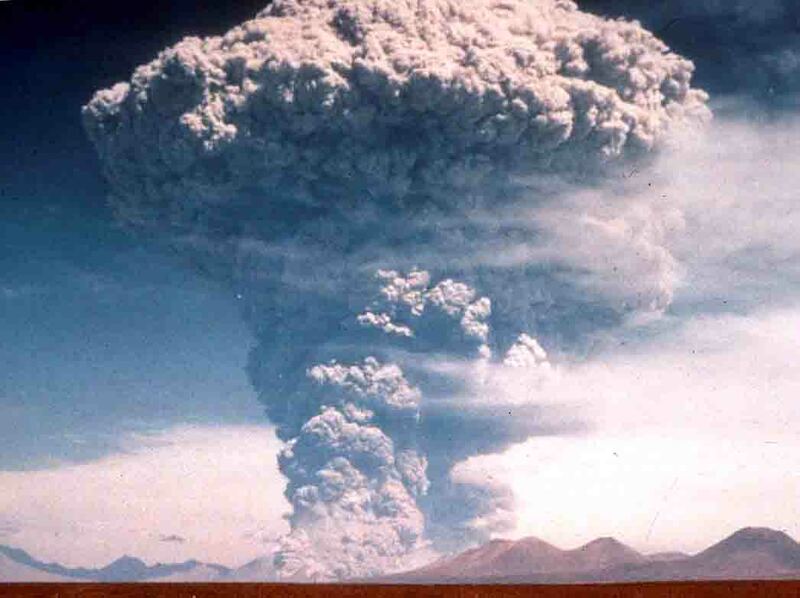 Pinatubo’s eruption cloud reached over 40 kilometers into the atmosphere and ejected about 17 million tons of SO2, just over two times that of El Chichon in 1982. The sulfur-rich aerosols circled the globe within three weeks and produced a global cooling effect approximately twice that of El Chichon. The Northern Hemisphere cooled by up to 0.6 degrees C during 1992 and 1993. Moreover, the aerosol particles may have contributed to an accelerated rate of ozone depletion during that same period. Interestingly, some scientists argue that without the cooling effect of major volcanic eruptions such as El Chichon and Mount Pinatubo, global warming effects caused by human activities would have been far more substantial. Major volcanic eruptions have additional climatic effects beyond global temperature decreases and acid rain. Ash and aerosol particles suspended in the atmosphere scatter light of red wavelengths, often resulting in brilliantly colored sunsets and sunrises around the world. The spectacular optical effects of the 1883 Krakatau eruption cloud were observed across the globe, and may have inspired numerous artists and writers in theft work. The luminous, vibrant renderings of the fiery late day skyline above the Thames River in London by the British painter William Ascroft, for instance, may be the result of the distant Krakatau eruption. Krakatau (1883) — Eruption of the Indonesian volcano Krakatau in August 1883 generated twenty times the volume of tephra released by the 1980 eruption of Mt. St. Helens. Krakatau was the second largest eruption in recorded history, dwarfed only by the eruption of neighboring Tambora in 1815 (see above). For months after the Krakatau eruption, the world experienced unseasonably cool weather, brilliant sunsets, and prolonged twilights due to the spread of aerosols throughout the stratosphere. The brilliant sunsets are typical of atmospheric haze. The unusual and prolonged sunsets generated considerable contemporary debate on their origin. They also provided inspiration for artists who depicted the vibrant nature of the sunsets in several late 19th-century paintings, two of which are noted here. In London, the Krakatau sunsets were clearly distinct from the familiar red sunsets seen through the smoke-laden atmosphere of the city. This is demonstrated in the painting shown here of a sunset from the banks of the Thames River, created by artist William Ascroft on November 26, 1883 The vivid red sky in Edvard Munch’s painting “The Scream” was inspired by the vibrant twilights in Norway, his native land. The further from the volcano you are, the more time you have to respond and the fewer dangers exist. Immediately around the volcano, dangers include earthquake damage, flying rocks, heat blast, lava, floods, and mudslides. Rocks can be thrown 20 miles from a volcanic eruption but the ash can travel hundreds of miles. • can dissipate into the high altitude wind stream and travel around the globe, possibly causing world-wide temperature changes. • can clog water systems, damage vehicle engines, make walking slippery, and effect vegetation. • can damage lungs and cause respiratory problems because it is extremely abrasive. It can also scratch eye tissue. • can accumulate and collapse buildings. 1 inch of ash weighs up to 10 pounds dry and up to 15 pounds when wet. • can short circuit electrical items such as computers. • can cause power outages which often happen after an eruption. • can corrode metal with long-term exposure. • can linger and cause problems for months and months after an eruption. • Keep 3 extra air filters and oil filters on hand for your vehicle. • Keep 3 extra filters for your home heating/cooling system. • Keep a roll of plastic wrap and packing tape so you can wrap and protect computers, electronics, and appliances from ash. • Store emergency food and water in your home. • Find out if your community has a warning system and know the warning signs. • Create an evacuation plan. It is best to head for high ground away from the eruption to protect against flood danger. • Define an out-of-town contact for all family members to reach to check in. • Besides your family emergency kit, have disposable breathing masks and goggles for each family member. The most active volcanoes in the chain include Mt. St. Helens, Mt. Baker, Lassen Peak, and Mt. Hood. St. Helens captured worldwide attention when it erupted catastrophically in 1980. St. Helens continues to rumble, albeit more quietly, emitting occasional steam plumes and experiencing small earthquakes, both signs of continuing magmatic activity. Most of the volcanoes have a main, central vent from which the most recent eruptions have occurred. The arc has formed due to subduction along the Cascadia subduction zone. Although taking its name from the Cascade Range, this term is a geologic grouping rather than a geographic one, and the Cascade Volcanoes extend north into the Coast Mountains, past the Fraser River which is the northward limit of the Cascade Range proper. Some of the major cities along the length of the arc include Portland, Seattle, and Vancouver, and the population in the region exceeds 10,000,000. All could be potentially affected by volcanic activity and great subduction-zone earthquakes along the arc. Because the population of the Pacific Northwest is rapidly increasing, the Cascade volcanoes are some of the most dangerous, due to their past eruptive history, potential eruptions and because they are underlain by weak, hydrothermally altered volcanic rocks that are susceptible to failure. Many large, long-runout landslides originating on Cascade volcanoes have inundated valleys tens of kilometers from their sources, and some of the inundated areas now support large populations. Could We Survive a Super Volcano? Observing the volcanic ash cloud and the disruptions to northern Europe from Iceland’s recent volcanic eruption causes one to think about other scenarios which would have grim and wider consequences from an event called – a Super Volcano. Our experiences with volcanoes have for the most part been with classifications that are somewhat tame in comparison to some events that have occurred in the distant past. I recall having observed a volcanic effect following the eruption of Mount St. Helens in 1980. At the time I was living in Massachusetts, about 2,500 miles from the volcano. Within a few days of the eruption, the ash reached the east coast of the US, and within 2 weeks was circling the globe up in the stratosphere (between 6 and 31 miles altitude). I clearly remember the reddish skies from the ash up in the high atmosphere, as well as spectacular orange and red sunsets. The ash remained in the atmosphere for years. Mount St. Helens was minuscule compared to the most dangerous type of volcano, the super volcano. Try to imagine an eruption that would be up to 10,000 times stronger than a Mount St. Helens. One that would threaten the very survival of all humankind. The super volcano is quite likely the worse case scenario of any and all possible disaster scenarios, mainly due to the fact that there is absolutely nothing that we can do to deter or prevent it. It’s devastation ranks up there with a large asteroid hit, world nuclear war, and worldwide deadly pandemic. • The very survival of human civilization would be threatened. An alarming statistic regarding Yellowstone is that it’s eruption cycle is about 600,000 years. That in itself is not alarming, however the fact that the last eruption was 640,000 years ago is alarming. Yellowstone is 40,000 years overdue! When considering the affects that such an event would have upon the world, it is nearly incomprehensible to create a survival plan. When considering Yellowstone for example, those that live in Idaho, Montana, and Wyoming will have a terrible if not impossible chance of survival. The entire United States will be covered with ash, probably at a minimum depth of 5 inches. How could one expect a chance to survive the effects of such a catastrophe? You may decide not to consider a plan of action due to the odds and magnitude of the situation. Well, you may be right if you live in the region, however there is always hope and a way for those living further away. The ‘four horseman’ will ride amongst Mankind in the aftermath of 1) the eruption of a supervolcano caldera; 2) a full scale, multi strike nuclear war; 3) a medium size asteroid impact; or 4) a solar flare that knocks out 1/4 the worlds electric power with an EMP. Anyone living during the time of even a ‘major’ volcanic volcano eruption, will come to know the concept of ‘The Four Horsemen’. That will be a time when human ‘over population’ quickly encounters a greatly reduced global harvest that continues for several consecutive years, or longer. In Biblical phraseology: The first Horseman rides a white horse, and he represents the anti-Christ, proclaiming false prophecies and crying the end if the world. He wears a golden crown and carries a bow in his hand. He is crafty, spreading a false sense of God’s Will while hiding behind the facade of Divine favor. The second Horseman comes colored in the blood of conflict. To roughly translate what Emil Bock writes, the Red Horseman rides “to destroy peace on Earth and to sow fighting amongst the people.” With his arrival, countries’ leaders will fight each other, while the Horseman oppresses the faithful of God’s children. The Black Horsemen brings with him disease and famine. His actions are directed to affect mostly the economy of a society, driving up food prices when crops fail, and making labor more valuable when plague kills off workers. Under him, the wealthy thrive upon the misfortune of the poor, who are unable to pay for the items they need to survive. Finally comes Death, riding a pale horse – one which is often described as ashen or greenish-yellow, the color of a corpse. His goal is to destroy all that has life on Earth.